Keystone Capital Markets is a leading investment bank that provides financial advisory and M&A advisory services to middle market businesses. It also provides banking services to domestic and international middle markets seeking liquidity to raise growth capital. 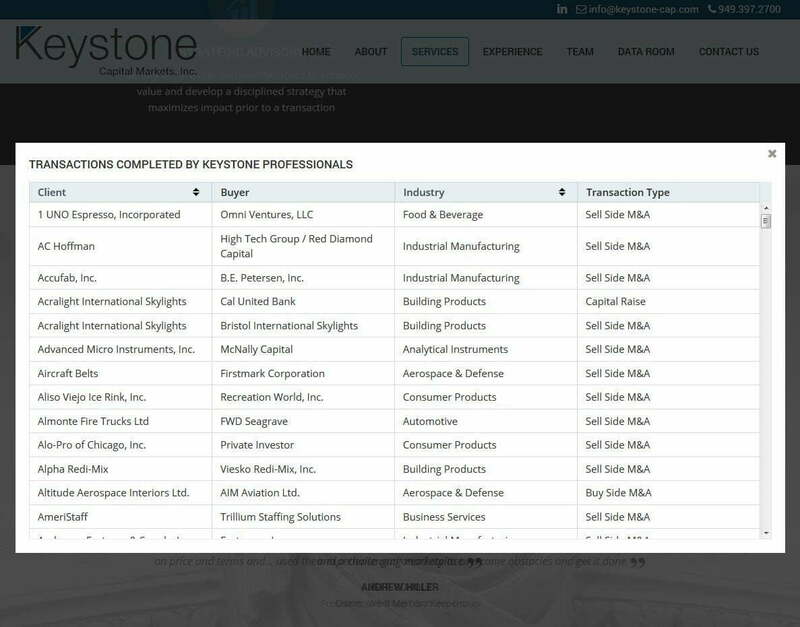 Keystone Capital Markets is a leader in investment banking, but it did not have an online presence. Not having a personalized website resulted in losing a crucial spot in one of the biggest marketplaces today – the Internet. With competitors already taking advantage of the digital space, what they needed was a way to better connect with their clients and the audience they wanted to reach. After completing due diligence and examining the requirements of the client, Pulse team proposed to design a feature-rich WordPress (CMS) based website to fuel the client’s proposition. Catering to the expectations of Keystone Capital Markets clientele, our designers crafted a website with a polished look and feel. Subtle texture, prominent logo placement, and modern style contributed to a contemporary look. Our design team eliminated the stuffy feel that is commonly associated with financial websites – instead, the website looked sharp, stylish and elegant at the same time. Design a website that better reflects their service offering. Provide responsive web design to improve device accessibility. Craft an elegant and sophisticated experience for users with smart navigation. Modern design elements and images integrated with social media. Launching a responsive web design has allowed Keystone Capital Markets to take strategic advantage of the digital marketplace. It helps to provide a high-end experience to users, which has resulted in increased visits, engagement, revenue, and a loyal user base. Nearly 40% increase in organic search. Fluid functionality and a fully responsive design convince prospective clients that their transactions will be handled with expertise. Stay ahead in the competition and gain dominance in the market with the newly launched website. Want to design a website for your organization? Contact us and we will help you gain momentum in the digital world!